This past weekend, while visiting the Holiday Fair at Grand Central Station in New York City, I came upon a very interesting booth called “Internal Fire Glass.” Naturally, this sparked my curiosity, and I immediately went in to the booth. Once there, I saw beautiful glass marbles of varying sizes that contained optical illusions: if you held a marble in your hand and looked down into it, the pattern inside the marble seemed as if it was spiraling down below your hand. As a huge fan of optical illusions, I immediately fell in love with this art form. One of Scott Pernicka’s marbles. I began to talk to Scott Pernicka, the creator of these marbles, about his amazing creations. I soon learned that he was very interested in combining art and physics to create his own amazing, unique design. One of the necklaces I designed. This especially caught my attention because I have always enjoyed finding creativity within fields with which creativity is not commonly associated. For example, I love to design jewelry, which is commonly thought of as a creative art. It is true that, upon first glance, this hobby of mine seems to solely relate to art; however, looking more closely, jewelry designing can also fall under the categories of math and science. My jewelry designs are often based on distinctive patterns I create in my mind, and this fascination with creating patterns can most certainly be attributed to my love of mathematics, which involves finding patterns both in mathematical formulas and in the surrounding world. 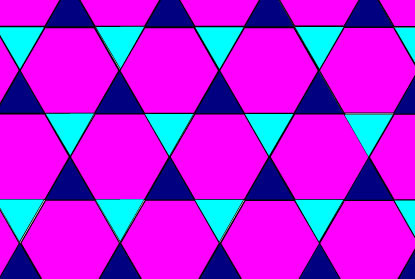 One example of this is the tessellation, a pattern that repeats over and over with no gaps or overlaps. This same concept of patterns can also be attributed to science, as can be seen with Scott Pernicka’s marbles, as well as with Newton’s Cradle, which, when its spheres are dropped in certain ways, creates patterns through the spheres’ movements. And so, I present to you the creative challenge of the day: design a pattern that appeals to you. This pattern could be in a tessellation, a jewelry design, a sketch, a poem, a sculpture, or anything else you can think of. In your daily life, what types of creative activities do you participate in? Which fields do these activities relate to? Are there any fields that you gravitate more towards? If so, why? Comment below to discuss. Be sure to check out Facebook and Twitter for more information on Internal Fire Glass and visit the Grand Central Station Holiday Fair up until December 24 to see the remarkable Internal Fire Glass marbles for yourself.